A talented teenager whose culinary skills have landed her a date with celebrity chef Jamie Oliver tested out her prize winning menu on schoolmates yesterday. Ellen Forsyth, 13, is the 2010 North East Cooks Champion and will travel to London next month for the national finals of the competition in front of TV favourite Jamie. Yesterday, fellow pupils at Ponteland Community Middle School in Northumberland were able to judge her cookery credentials for themselves when they sat down to enjoy her three-course creation for lunch, prepared by kitchen staff. 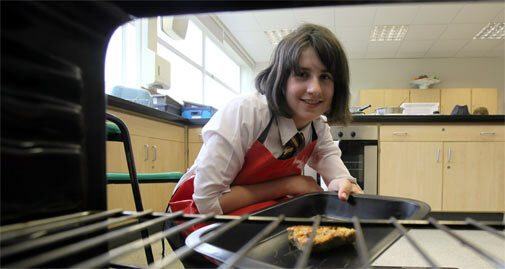 Head girl Ellen was one of four students from the school who entered the Cooks Challenge sponsored by Sainsbury's, the British Nutrition Foundation and the Design and Technology Association. It is part of the Active Kids Get Cooking initiative, and the theme of this year's challenge was sustainability, with the emphasis on using local produce and reducing food air miles. Ellen used leeks from her family's garden for her starter, leek and potato soup. This was followed by wholemeal savoury bread pudding, with mixed leaf and roast beetroot salad with apple balsamic dressing, followed by apple filo baskets and vanilla fudge ice cream. 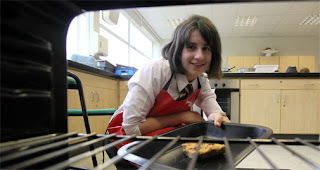 She and her three fellow Year 8 students created their recipes using local produce, including bread from Davidson's bakery in Darras Hall, flour from Gilchester's organic farm in Hawkwell, carrots from the school garden and ice cream from Vallum Farm tea room at East Wallhouses on the Military Road in Northumberland. Ellen's menu was chosen as the best in the region and she will now travel to Sainsbury's headquarters on June 23 as one of the 12 United Kingdom finalists. She has already won a £100 prize for the school's food department. Jamie Oliver will sample all the winning entries and announce the three overall winners. Yesterday, Ponteland Middle food and textiles teacher Charlotte Hancock, who will accompany Ellen to London, said: "The whole school is so proud of Ellen and her fabulous three-course meal will be available for everyone to enjoy. "Our four students worked very hard to create healthy recipes and source local food."